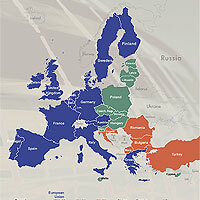 (Window on Eurasia – Paul Goble – Staunton, January 3, 2013) Ukrainians and Moldovans are not the only nations between Moscow and the European Union who would prefer to be part of the EU than any Moscow-dominated entity and certainly don’t want their country to be absorbed by the Russian Federation. 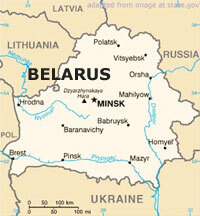 A new poll shows that Belarusians have the same attitudes as well. According to the results of a poll conducted last month by the Vilnius Independent Institute of Social-Economic and Political Research, Belarusians say they would oppose a union with Russia, back membership in the European Union, and, if forced to choose, would sacrifice ties with Moscow to be in the EU (vg-saveliev.livejournal.com/628133.html). At the same time, according to a report on this research by Russian commentator Valery Savelyev, the poll found that nearly half of all Belarusians do not trust Alyaksandr Lukashenka, commonly identified as “the last dictator in Europe,” although slightly more than a third say that they do. The pollsters asked the Belarusians four questions. First, how would Belarusians vote if a referendum were to take place today on the unification of Belarus and the Russian Federation? Some 23.9 percent said they would vote for it, but a majority, 51.4 percent said that they would vote against. Second, how would they vote if a referendum were to be held on joining the European Union? Just over a third, 35.9 percent, said they would vote in favor, but only slightly fewer, 34.6 percent, said they would vote against. Third, how would they vote if they had to make a choice between uniting with Russia or joining the EU? In that case, 36.6 percent said they would vote for union with Russia, but 44.6 percent said they would vote to join the European Union. And fourth, do they trust their current national leader, Alyaksandr Lukashenka? Nearly half, 47.5 percent, said they did not, although more than a third, 37.7 percent, said that they in fact do. “In general,” Savelyev writes today, “the peoples of the surrounding countries do not like the Russian state,” but he expressed the hope that what it is that they do not like are the Russian authorities and elites rather than the Russian people themselves. Indeed, he adds, there is nothing wrong with these nations wanting a Western lifestyle and standard of living. He adds, however, that “if a similar poll was taken among residents of the regions of Russia [itself], the result would be approximately the same, [an outcome that is] much sadder.” And he lays down a challenge: “if some idiot wants to make of this a call for separatism,” let him proceed. But of course, the residents of Russia’s regions have not been given such a choice and won’t be “in the foreseeable future.” Consequently, such a survey should be taken of Russians as a whole. Were that to happen, can anyone doubt, Savelyev suggests, that the Russian answers would be like the Belarusian ones?